We’ve completed two rounds of A/B tests and we’re ready for phase 3, a final round of testing before we release the new site wide navigation to all users on Stack Overflow (English) and MSO. If you’d like to participate, just go to your user settings under Preferences and opt in to the "New Site Navigation test". Both previous tests showed great results: users shown the new top nav clicked navigation links 143% more than those shown the current design. This leaves us reasonably confident in the utility of making these tools more accessible. But, there are still a large number of people (including most of our most avid users) who haven’t been involved, so for this final round of testing we want to open it up to everyone; if you weren’t part of the A/B tests, now is your chance to kick the tires! The goal of this week’s test is to uncover any bugs we missed. Once we’ve resolved any major bugs, we’ll roll it out for everyone. Please create a new post with the top-bar tag or post an answer to this question if you find new bugs. As always, we appreciate your feedback. While there won’t be any major feature changes between now and the first full release, we’ll consider all your ideas for future updates. I loved the visual distinction between new messages (red), new achievements (green) and new mod messages (blue). I'm still not a big fan of the bar being sticky. It doesn't take up as much vertical space as I feared, but it still takes up some, and unnecessarily so. What is the point of sticking the navigation into my face when I'm trying to comprehend a long post and want 1) as much vertical real estate as possible and 2) as little distraction as possible by any notifications? Going back up to the navigation is one flick of a finger or one press of a button, so I'm not seeing what a permanently visible bar accomplishes. The site switcher menu is too narrow and too close to the notification items and too fickle in staying open. It's natural to want to click on the menu and then move the mouse diagonally to the item in the menu you want to click on, which are all on the opposite left aligned side. Doing so almost inevitably means I'm crossing through the neighbouring notification menu item, which closes the site switcher menu and opens that menu instead. Which is infuriating and requires super delicate mouse movements to avoid. Turns out low rep users do have it, so it's less terrible than I thought. Still, I would like to have it as well - useful as shortcut. The sticky toolbar was sure to be controversial. I'll add myself to the group that does strongly dislike it. I don't really mean the reduced vertical space for the rest of the content, I use a relatively big screen and I'm not really worried about that aspect. But I find the sticky toolbar irrationally distracting, and there isn't really a way to fix that. So what I'd request is to make the stickiness configurable. I know SE hates preferences, but I thought I could at least ask. I think a light grey (#efefef, maybe even lighter) would give enough contrast without spoiling the design. Positives: There is something quite nice about "simpler" look overall and I do like the little things like the badge "jump" when you hover over an icon. In summary, I am in favour of the change - it's really just the white on white that I can't live with. But I also notice that the "achievement" icon on the old top bar is glowing green. That's a subtle indication that I have a badge somewhere. No particular hurry to see it, so it's not as noticeable as the red number 7 showing my unread inbox count. Meanwhile, the blue diamond is also glowing to let me know that there is something unread in my moderator inbox (typically mod messages and meta posts). Again, these aren't as pressing as flags, so the indicator is a color change rather than a number. As far as I can tell, this behaviour is missing from the new top bar. Move the inbox and achievement notifications before the user's avatar to provide a clear separation between personal and community notifications. So far I like the new locations for most of my cheese. But I do wish there was a quicker path to the help center and meta/main (depending on where you are). I also feel like some of our hidden away tools have gotten more hidden. I like how clean the menu is, but I'm missing a grab bag of links as the "help" menu eventually turned into. It's a tradeoff and I'm well aware my needs are not mainstream. I just wish there were some path to get to the geitost for those of us who have a taste for it. feature-request Some people like to review queues other than Suggested edits. Please make the review button a dropdown like the other ones in the row and show all of the accessible review queues. Also, please allow us to change the number shown to be something other than the number of pending suggested edits, or nothing at all. feature-requeststatus-completed I'd just like to request the addition of a Privileges link since it looks like there'd be room for it beside Badges. I actually use the privileges link more than I do badges because it has a greater influence over my use of the site - where I can review, edit, etc. Apart from that, I actually have very few complaints about the new nav bar so far. That notification annoys the hell out of me. Like really a lot. I continuously think I have a new reply, comment, upvote or whatever, only to discover it's the review queue. The constant blue icon in my top right constantly nags at the back of my brain, there's something, there's something. Please make it less conspicuous that it drags less attention. I sometimes spend time in the review queue, mostly not. But since the menu is now ALWAYS in my sight because it's sticky, it will constantly nag me/be in my face instead of be gone when I scroll down. I have a simple solution for this: If I don't hover the menu, let it be gray. Is there any need for users with less than 2k to have the suggested edits button? 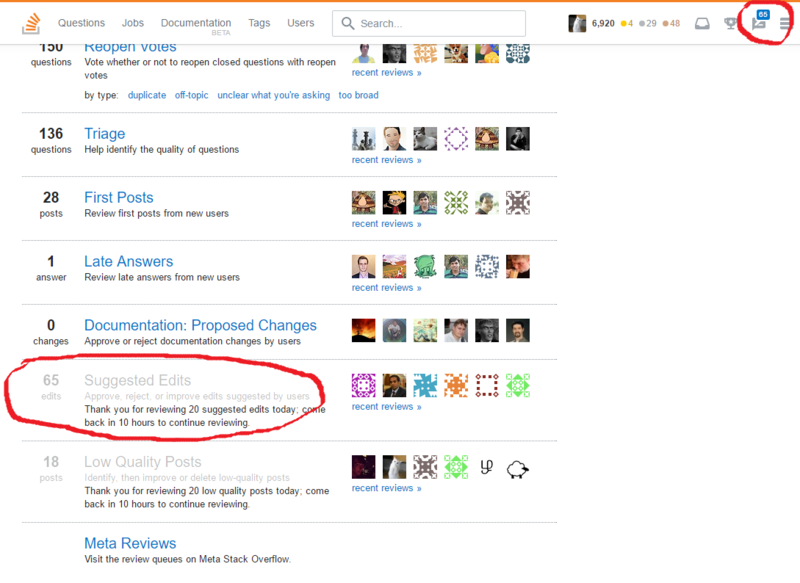 But then leads you to Suggested Edits (https://stackoverflow.com/review/suggested-edits). 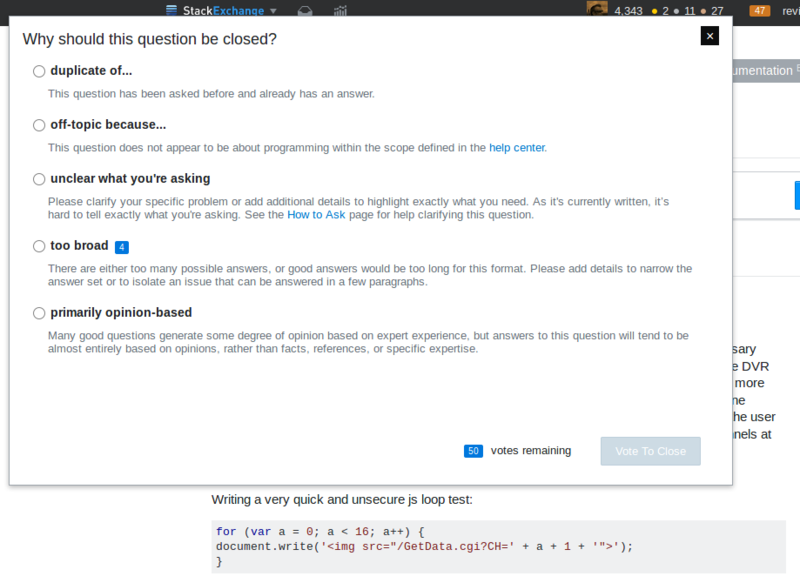 I guess it should actually lead to the review queues (https://stackoverflow.com/review/), but then the tooltip might be a bit hard to calculate! Usually the Stack Exchange icon contains 4 blocks in it. Example in the previous top bar and MSE site. 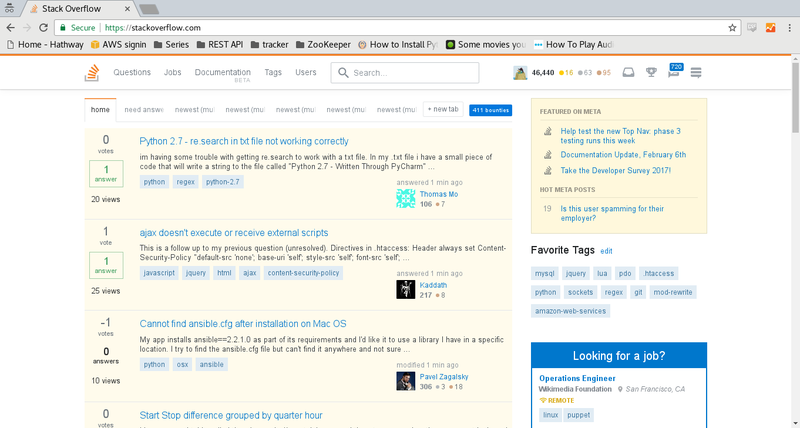 But in the new top bar the Stack Exchange icon contains only 3 blocks in it. For the uniformity the icon should be the same number of blocks in other place. bug status-completed Keyboard shortcuts for the new icons are broken. I use I and R all the time, and these not working may require me to opt out of the beta. I'll see how long I can tolerate this. There are some glaring problems with this design. Also, the sole metric cited here, "users shown the new top nav clicked navigation links 143% more than those shown the current design" is a terrible metric. Why are we aiming for more clicks to do the same thing? There is no access to the help center with the new design! What is this madness?? The same goes for the tour! oh, but it is in the set of links in the footer, you say? No. Not enough. How are new users expected to know any of the already semi ridiculous expectations of asking their first question without this content? They aren't, they won't, and it will negatively effect question quality and user experience. These two facets, question quality, and user experience, should be the bar you look at for improvement. Not #of clicks before / #of clicks after. Why is review a link? Seriously, in a set of modals, why is the review icon a link? That alone probably leads to an excessive amount of clicking around, especially considering that if a new review comes up, and you click to see what that alert means, it navigates you away from what you were doing. It should be moved elsewhere. In fact, it should be grouped with help and there should be a modal for that set of tooling - those aimed at improving question quality and user experience. The top bar is now sticky. I get it, but why? feature-request Make the top bar smaller. It doesn't really bother me when I'm at the top of the page, but when I'm focusing on actual content, I like my vertical screen estate, as deceze puts it. So at least when you scroll down the page, maybe in a responsive kind of way? Here's a preview of what that could look like (I made it 30px here, the "BETA" font size had to be reduced a little). And a stylish style sheet to obtain that, in case you want to play with it (NB. this stays small when you're at the top of the page). Tot Zam similarly proposed a slightly less aggressive reduction of height and paddings. because the super-mega-expando search box is annoying. Not as much as previous iterations, but annoying nonetheless. feature-request Don't animate what I'm already looking at. I click on the box, or type s, and start typing a search query. While I'm typing, the damn &()@#$&()^$&*(## thing moves. So I lose track of what I was looking at and need to spend a few seconds refocusing. I wanted to search something dammit! And there's an animation again if I move the focus out of the search box. WHY?????????? The good news is that this is the only major flaw! It's definitely not as bad as the previous top bar change. So thank you, I guess. I really like that the boilerplate doesn't take much space. Not like the current design where if you have a 16/9 landscape monitor you'll probably end up with less than half a monitor's worth of content of the front page, between the OS artifacts, the browser artifacts, the top bar and the huge rectangle with the site logo. Thank you for making the top bar usable without having an insanely wide browser window! The narrowness of the search box in its off state is unfortunate, but I think that's an acceptable compromise (as long as it expands without animating). I'm ambivalent about the sticky top bar. I don't see it as useful, but it doesn't distract me much. It might be annoying to waste the space with browser windows that are not very tall though. feature-request status-completed Make the stickiness a configuration option. Stack Exchange's user interface doesn't have enough configuration options. feature-request Put the site name in the top bar. For two reasons. For people who don't have an account, the indication of what site this is is useful. Especially since this top bar looks quite a bit like any other trendy website's top bar these days. 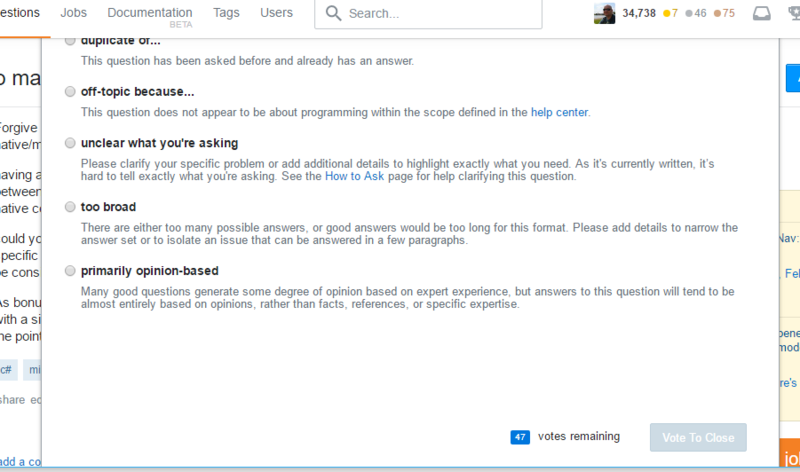 For people who do have an account, the indication of which Stack Exchange site this is is useful. Sure, SO has a distinctive icon, but many beta sites don't, a few are even non-unique. When the mouse hovers above the colored numbers on one of the top-right boxes (inbox, achievements, review), the number moves. WHY?????? I'm trying to read the number, don't move it! Just because you can make animations in a browser doesn't mean you should. Seriously, stop that, please. feature-request Don't move the numbers. Where's the “about” link? feature-request Show an “about” or “help” or “tour” link to new users. When I go to some random website which is more than two pages slapped together, I want to know what this site is about, who runs it, etc. This is especially important for a site that users can interact with. Here, there are links for “about us”, “tour” and “help” but they're buried somewhere towards the bottom of the page — essentially impossible to find without searching. A good organization could be to show “tour” and “help” in the top bar for anonymous visitors and low-rep users. 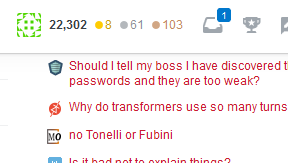 For veteran users, put those links in under the Stack Exchange slash hamburger menu at the top right. There are four icons at the top right. Clicking the square bra opens a menu on the page. Clicking the trophy opens a menu on the page. Clicking the pen-and-paper switches to a different URL. 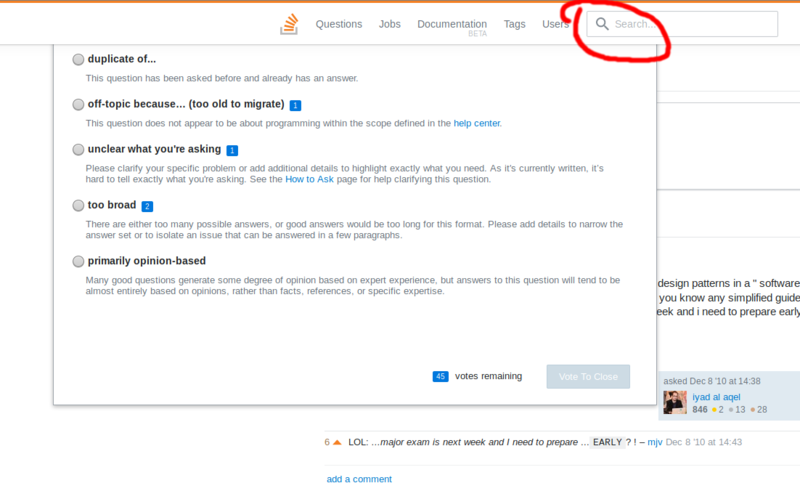 Clicking the Stack Exchange hamburger opens a menu on the page. feature-request Make the review icon consistent: open a menu with links to the various review queues (plus /tools for 10kers). “Unanswered” is gone from the toplevel menu. Ok, having it under “Questions” is enough. “Badges” is gone from the toplevel menu. Yay! I see from a mod's screenshot that if you're a mod, the mod menu is inserted in the middle of the icon array, so some of the icons are moved. feature-request Put the icons in a consistent location, add the optional icons at the end (i.e. at the left, since the icon array is right-aligned). While you're at it, could you please fix the regressions introduced by the previous toolbar redesign? Make the inbox icon easier to access. It used to be in a corner, then it moved to some random middlish place, and now it's in a different middlish place. feature-request Put the inbox icon in a corner. feature-request Replace the square bra icon by something recognizable such as an envelope. feature-request Give me back a reliable count of votes I've cast today. feature-request Remove the list of badges next to my avatar. This information is extremely minor and shouldn't waste space on every page. feature-request Put my username instead. Seeing my name is a very convenient way for me to see that I'm logged in on the site. Seeing a tiny icon doesn't have this effect. feature-request Restore the feature that pressing Ctrl+Enter in the search box opens the search results in a new tab. This is a more recent regression, dating back to a jQuery update. This feature would make the sticky top bar a lot more useful: searching is the one thing I often want to do when I'm in the middle of writing an answer (to look for older posts to cite on a related topic) or when I've scrolled down to the bottom of a question (to look for a duplicate). One thing that confused me a few times now was the counter for the review queues. It's now directly besides the inbox and achievement counters. The inbox and achievement counters are about me, the user. The review queue (and also the moderator flag counter, which I can't see on SO) are about the site. I found that confusing, though this might go away over time. I'd generally prefer to make those different types of counters distinct in some way, but I'm not sure if that is possible without disrupting the rest of the new design. I was just looking at https://github.com/ and I think SE should take a few design ideas from their header. This example demonstrates how some of the complaints brought up in other posts can be addressed. Their header is not dark, yet still has enough contrast which separates the top-bar nicely from the rest of the page content. There is minimal whitespace and padding on the top and bottom of the navigation elements - enough for it to look good, yet not too much that it wastes excessive amount of screen space. The search bar is in the front of the top-bar and not floating randomly in the middle. The search bar can be placed in the beginning or end of the top-bar, yet it doesn't belong in the middle. The height is also shorter than GitHub icon, which makes it look better. The current SO search bar is for some reason taller than all the other navigation elements, making it slightly jarring. They just display their icon and not the GitHub company name, and no one has ever complained about that. I think once people get used to how the SO icon currently is on the main SO site, it will be fine. 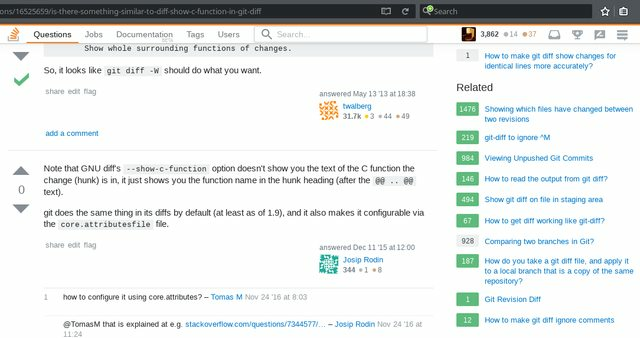 The StackOverflow words can probably be removed from meta. A large element that takes up a lot of space on the SO header is the reputation and badges count next to the avatar. I know it is a nice moral boost to always have your accomplishments visible, yet I'm really not sure this is necessary to always display. Removing this information would clear up some horizontal space in the top-bar, thus increasing usability. I personally would vote for usability over seeing my rep and badges. If too many users like this display and this isn't removed, another idea would be make the numbers two lines and move the rep number on top of the badge count, which would at least add a drop of horizontal space to the bar. Yes, there are few less tabs and icons on SO than GitHub, yet the GitHub bar still seems to be sooo much less crowded even after I added a few placeholder items. This post is my initial feelings on the new bar. I'm going to use it for a few hours, based on Shog's advice, but I want to document my first impressions/issues with the new bar. The new bar is thicker than the current black top bar, but the "Ask Question" button seems to start at the same location. This makes the page feel more "squished". This is a minor detail. Related to that "squished" feeling, is the lack of contrast between the navigation and the page content. I've navigated around the main and meta sites for a little while now and I can safely say that I am not a fan of the sticky navigation bar. It is distracting and contains links to things that I don't need immediate access to. I click on "Questions" 1-2 times a day. Usually, I spend my time watching specific tags, not watching the newest questions. I click on "Jobs" a handful of times a week. I don't use the documentation button on the navigation bar. Instead, I use the documentation link inside of the ways I am watching. This gets me directly where I want to be, instead of requiring me to navigation the documentation main page. I can't remember the last time I needed the "users" or "tags" links. The search on Stack Overflow leaves a lot to be desired, so most of my searching occurs through Google. The other indicators are a great way to interrupt what I'm doing. With the black navigation bar, I can answer a question, work on reviews, etc. with the bar out of sight. If I get a notification, I don't see it immediately. Now, as soon as I get a notice, I am distracted by the new indicator. Moving the mouse down into the site selector is tedious. It's already been mentioned, but I think it's important to mention again. The easiest path to take once the menu is open is a straight line, not down then left. Unfortunately, the straight line causes the box to close (because I hit the review queue "menu"). Worse, it doesn't close completely, so in my confusion to reopen it, if I mouse over any of the other menus, there are multiple popup menus. I haven't used the new bar on my phone or tablet yet. I will document those when I do. Summary of first impressions: I am trying to find things I like, but that stickiness is really making me hate it. I can get used to the new icons and the links being moved around, but I don't think the navigation bar being stuck there constantly is actually helping me navigate around the site. I don't use any of those links consistently enough to need immediate access. The indicators on the right are more of a distraction. That makes it feel like wasted space to me. There still seems to be a bit of extra whitespace surrounding all the navigation elements. Currently the average height is 57px and the padding is 16.5px. If you decrease the height and padding even just slightly, it still looks okay and it wastes less screen space. This should make users concerned about the nav eating up their screen happier. As numerous others have pointed out, "Review Queues" notification is extremely annoying. I don't wont it to show "unread"s if I cannot review any suggested edits. Why is other categories ignored? Don't you want my involvement in other categories? feature-request: Please make it possible for the users to subscribe to the review queues they like. For example, I personally don't like to Triage. And then, make the indicator show the number of review queues that has items, AND that user has subscribed, AND the ones that user has not exhausted the daily limit. I can promise you that I will be more engaged in the review process if Stack Overflow does this. feature-request I'm really not a fan of sticky sections on desktop browsers. Could we get an option to unpin it so that it doesn't stay visible when we scroll down the page? and you only get that option if you managed to navigate to another tab. That should reduce the influx of low quality stuff dramatically. So basically the new top bar is both improved navigation AND a quality project. I like the new header and design, though I did find a bug with the modal windows when going through the close queue. At a certain time I could drag the model window in such a way that I couldn't drag it back or reach the close button. Actually I think this is more of an issue that you think. I just happen to be using a laptop with a small screen right now (1366x768) and with a bookmark bar in Chrome the top of the modal is not visible. If I make the vertical size a bit smaller, the top of the modal is completely inaccessible. As Pawel remarked this has not to do with the new navigation, I switched back to the old navigation and there the behavior is different. 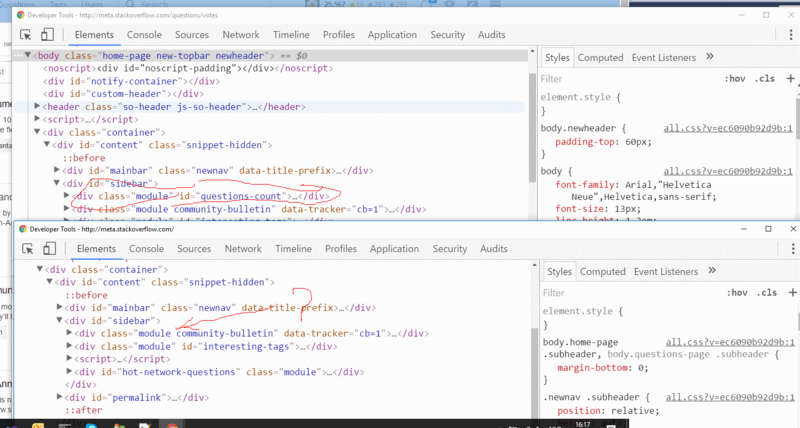 It looks like the span gets a _positive class on refresh that is missing in the Ajax update. When you click “Full Page” below, try to close it. One of the things I appreciate about the existing top bar is not having to click to switch between the site switcher, the inbox, and the achievements dropdown once one of them has been opened. The arrangement of the icons is different in the new version, but it'd still be nice to at least be able to go between the inbox and achievements without an extra click. Ideally, being able to switch between all dropdowns even after mousing over the "review" icon so long as the cursor doesn't leave the topbar would be good too. What I DO want to see while I am scrolling are new achievements or new comments to questions. They are FAR on the right, on the periphery of my glance. I do not understand the UX need for the links to places I never go to take precedence to information I need all the time. How does Stack Overflow (technically) perform opt-in like A/B tests?